Difference between revisions of "Timothy Canty"
Samuel Thomas Gill, Provident diggers in Melbourne, c1854, watercolour and gum arabic on paper. Timothy Canty was born in Limerick, Ireland. The inquest held on the man Michael O'Keefe, who died in the hospital on Monday last, was continued to a late hour last night, and was adjourned for a week, to admit of further evidence being produced. From the evidence taken it was shown that on the 8th of this month the deceased had been drinking at an hotel near Warrenheip, kept by one Timothy Canty, where a man of the name of Dennis D'Arcy was also drinking. That the latter and he quarrelled, and he went away to the Rock of Cashel another inn, about a mile distant. As a man named Prendergast was coming into Ballarat after dark, he heard a voice, as if of some-one moaning, between Cantys and the Rock of Cashel and passed Dennis D'Arcy with his brother, Thomas D'Arcy, not far from a culvert winch was close to where the moaning voice proceeded from. Deceased made his way to Canty's early the next morning. He had his jaw broken, and was very much bruised, and marked with blood. He said two man had attacked and beaten him near the culvert. He was sent to the hospital, from whence, after remaining a short time, he returned to Warrenheip, where he was found insensible on Sunday last. The description he gave of the two men who assaulted him corresponds with the two D'Arcy's who were examined, and who gave their testimony with freedom and apparent candour. They said they had been in his company, that he was drunk, and quarrelling with several other men at the Rock of Cashel public house. 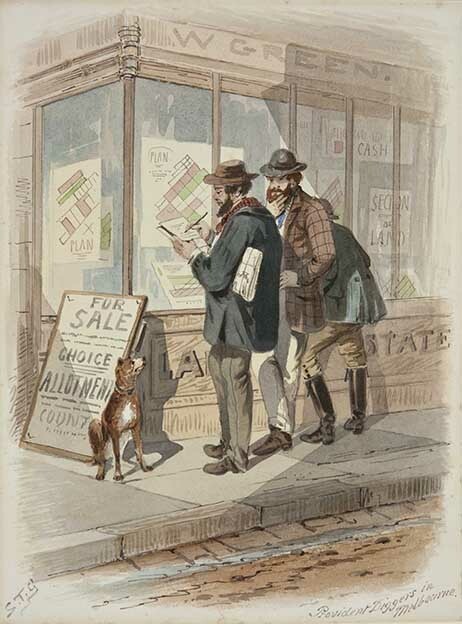 Messrs Everingham, Greenfield and Co. report the sale of 6 acres land at Warrenheip, the property of Mr Timothy Canty, to Mr Francis Diamond, for £250 cash. The Friends of the late Mr TIMOTHY CANTY are respectfully invited to follow hie remains to their last resting place, Gordon Cemetery. The funeral will leave his late residence, Green Hill, near Gordon, This day (Tuesday), at 3.30 p.m.
An old and respected colonist, Mr Timothy Canty, died at his residence, Green Hill, Gordon, on Sunday last. Deceased was suffering for years past from, consumption, and was attending the Ballarat Hospital for some time. He was only 58 years of age, and 51 of these he spent in the colonies, he being only seven years of age when he came to New South Wales with his parents from Limerick. He was married, and leaves a widow, 11 children, and several grand children to mourn his loss. His remains were interred on Tuesday, in the Gordon cemetery. The Rev. W. Harnett officiated, and Mr S. Wellington carried out the funeral arrangements. The funeral cortege was large, friends coming from a long distance to attend it. ↑ The Argus, 26 February 1874. ↑ Ballarat Star, 02 July 1877. ↑ Ballarat Star, 09 April 1895. ↑ Ballarat Star, 12 April 1895.